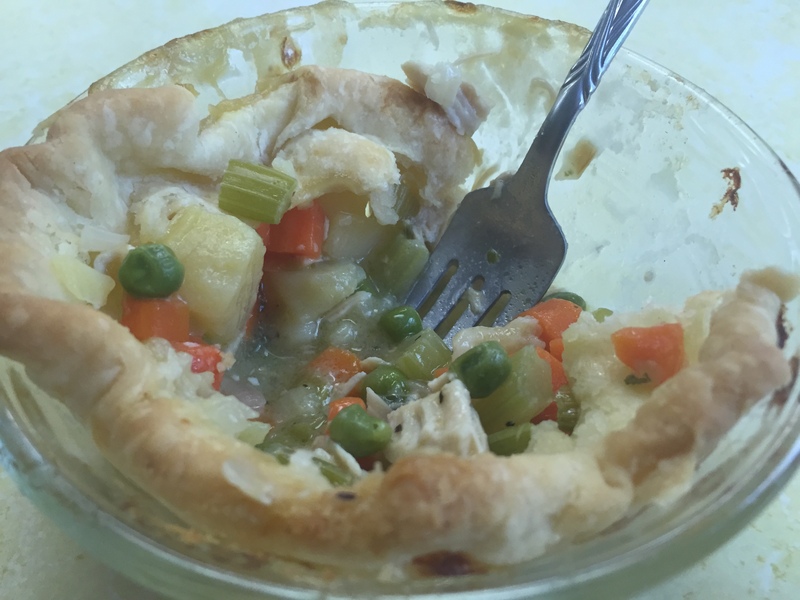 Do you remember the sublime delight of your own individual pot pie in the aluminum foil pie tin from the grocery store freezer and baked in your oven at home? I certainly do, but the anticipation of my very own pot pie for dinner diminished rapidly after the first few bites. Where was the chicken? The crust wasn’t too flaky, either. And finding peas was like searching for gold. Lots of work and not much payoff. 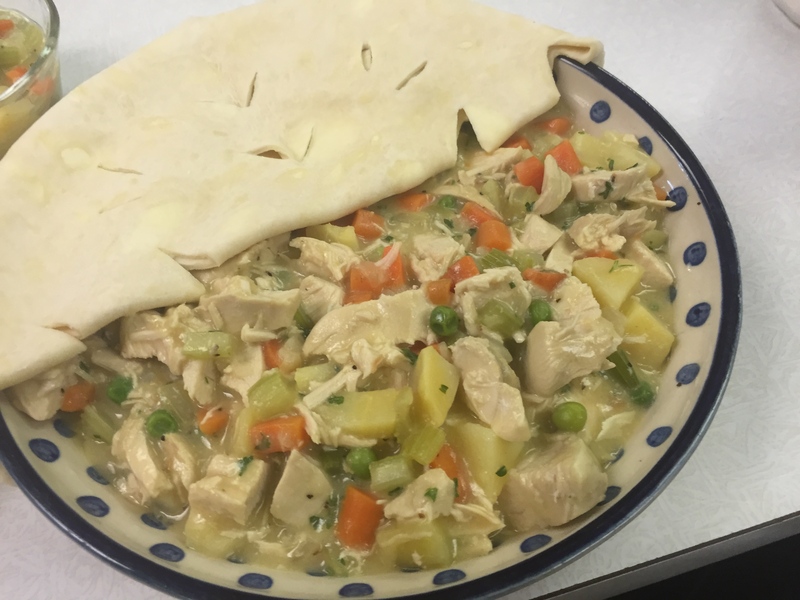 Kiss those kiddie potpies goodbye with this luscious redux, so simple that’s it’s hardly a recipe and more like a template for a luscious crusty dinner. You’ll learn a few piecrust tips, too. And don’t tell anyone the secret ingredient, which I painfully realized was essential to the unctuousness of this dish when I insisted on a handmade broth and cream sauce which fell flat. Finely dice onion, chop celery and carrots into smallish pieces. Saute vegetables for 10 minutes in butter and oil. When vegetables are partially cooked, stir in flour for 1-2 minutes to heat mixture. 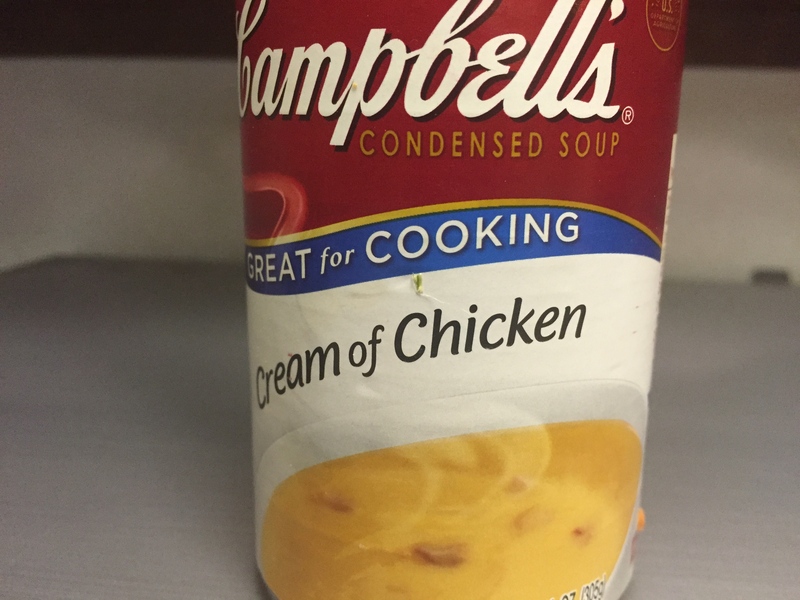 Stir in cream of chicken soup. Stir to heat. 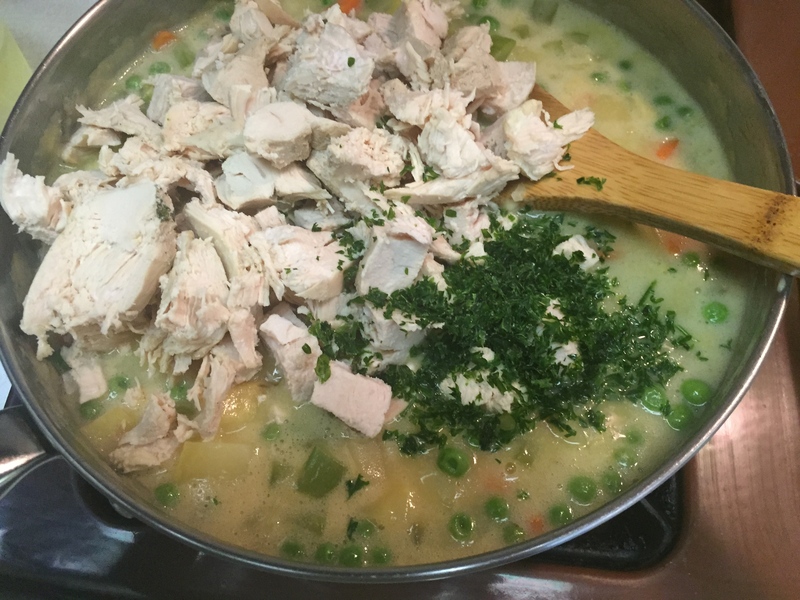 Add chicken broth gradually, beginning with one cup and adding more if needed for a medium-thin saucy consistency. Heat to bubbling; allow to simmer for 10 minutes;check for seasonings. 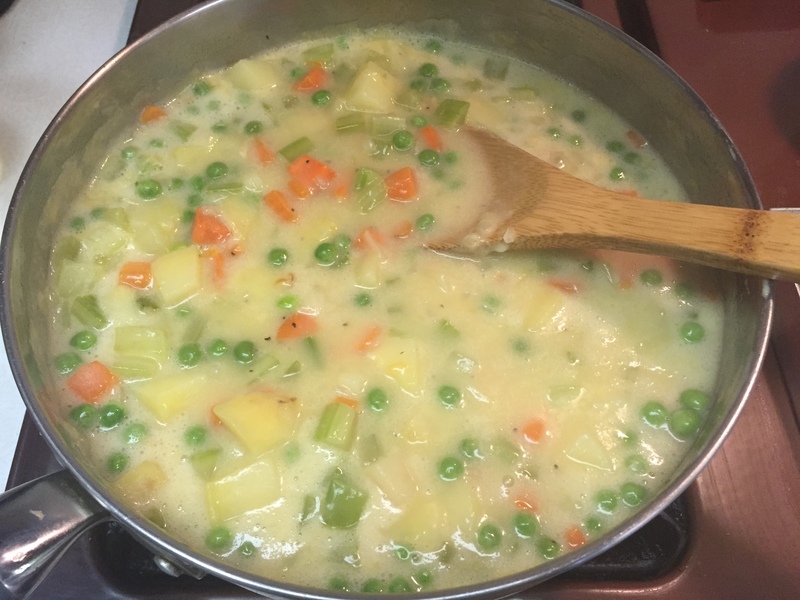 Stir in peas and chopped potato. Right before taking off heat, stir in reserved chicken. You have your fabulous filling. Now for the piecrust. There are lots of ways to handle crust- but the best way in my opinion, is to make crust in the food processor! I’ve made tart crusts, pate brisee, and American piecrust in the food processor and I get more compliments when I use this French invention than when I slave and sweat with manual labor. 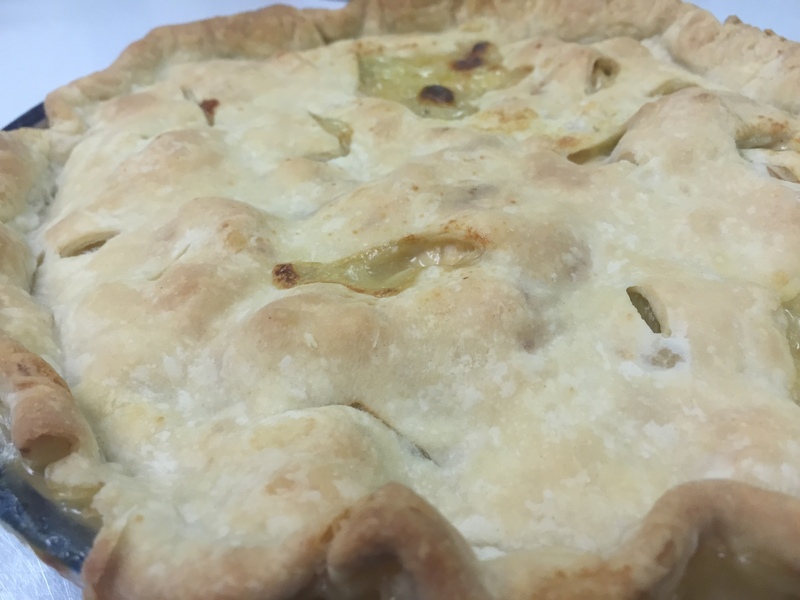 Piecrust is something you have to put in your hours to gain some competence: you will create inedible pasty crusts, shattering crusts, and impossible to cut crusts. People will try to eat your pie crusts and they will not be able to, and you will bow your head in shame. You will screw up, and then one day you will have sublime flakiness that shatters in your mouth and you will never look back or buy a refrigerated piecrust, an abhorrence to all that is decent in the world. It’s worth the pain for the payoff. My other secret: Everything must be COLD! ice water, butter, etc. And my best secret: piecrust mix in the refrigerator. All I need to add is ice water. Mix salt and flour in food processor. Add butter and shortening, cut into pebbly chunks in flour mixture with food processor blade in pulses. Don’t over -mix. Put dry mix in refrigerator in tightly covered container. 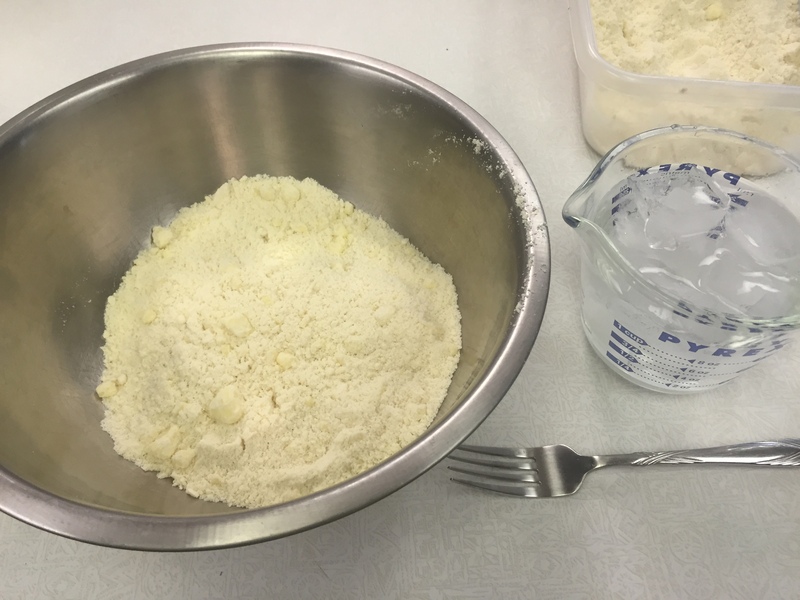 When it’s time to make pie crust, pour some of your mix in a bowl, sprinkle with ice water, and form into a ball. Working quickly, roll into rounds. fold over, cut steam vents, and drape over filling. Bake pie (large) for 40-45 minutes in 400 degree oven. Individual potpies are lovely and bake in 25 minutes. Prepare to be transported to the childhood potpie you dreamed of but never had, now a reality!